When Lucy meets David Wolf&ugrave;a rugged, reclusive man who lives on the outskirts of town&ugrave;she thinks she can catch the attention of the town with his photograph. She doesn't count on her feelings stirring whenever she's near him. New York Times best-selling author Margaret Brownley has penned more than twenty-five historical and contemporary novels. Her books have won numerous awards, including Readers Choice.Though successful, Margaret decided to leave behind the secular publishing world to follow Gods will for her: to write inspirational fiction. Since then she has published the Rocky Creek series and A Lady Like Sarah was a Romance Writers of America RITA finalist.Happily married to her real life hero, Margaret and her husband have three grown children and live in Southern California. A Vision of Lucy by Margaret Brownley tells the story of Lucy Fairbanks, a young girl in the post-Civil War small town of Rocky Creek, Texas. 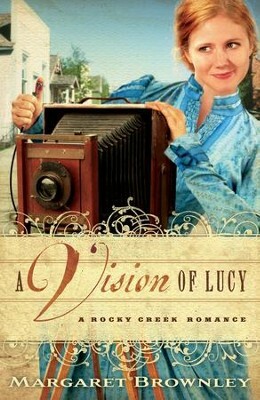 Trying to follow her dream of becoming a photographer, Lucy meets a mysterious stranger with an even more mysterious past. 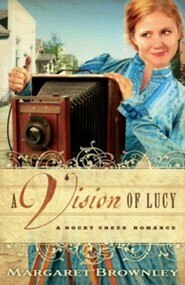 Questions pour through Lucys heart as the stranger brings unwanted memories back to Rocky Creek. Brownley's ability to create characters meshes well with her ability to create strong background stories. Her descriptions and attention to detail do an excellent job of bringing the reader back in time to the late 1860s. Lucy is faced with the challenge of finding her place in the world while discovering her feelings for David Wolf, who is half Indian and half white. Lucy helps Wolf uncover the secrets that have haunted him his entire life. They discover together the plans that God has for them (Jeremiah 29:11). Lucy is always ready to see the good in others and willing to help in any situation. She relates to major and minor characters through her love and compassion. Although she has trouble recognizing Gods presence in her life, she puts peoples' needs ahead of her own and tries to encourage and build them up. I'm the author/artist and I want to review A Vision of Lucy - eBook.